Papua New Guinea, which sits north of Australia and east of Indonesia, is arguably the most diverse country in the world, with upward of 800 languages and even a few uncontacted tribes. Even though it shares the large island of Papua with Indonesia, a Southeast Asian country, it’s considered part of Melanesia, the southwestern reach of the many islands of the Pacific. The cultural grouping is certainly reflected in the ingredients and methods of cooking. We’ve come to discover that food in Oceania isn’t centered so much around recipes, as it is around techniques that can be applied to whatever you’ve got on hand. Fortunately, a returned Peace Corps volunteer got in touch and dropped off a well out of print cookbook that provided enough guidance to pull together a meal. I ended up cooking the entire meal with fire. While digging out a hole for an earth oven wasn’t an option, I have both the chiminea pictured above as well as a kamado-style barbecue, so I made it work! 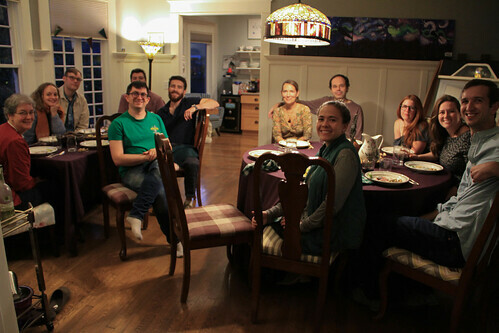 Our guests for the evening were Susan, George, Josh, Sofie, Andrew, Quinn, Philip, Leigh-Anne, Jessica, a few friends whose names I didn’t grab, and of course Mary. 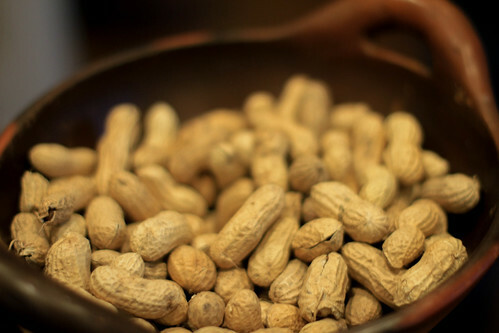 Just some fresh peanuts that I toasted over the aforementioned fires. Nice to have a warm snack to occupy your hands and your jaws while you wait. Another snack to go along with the peanuts. Pro-tip: after slicing each half of the mango away from the pit, use a big metal cooking spoon to scoop out the flesh. 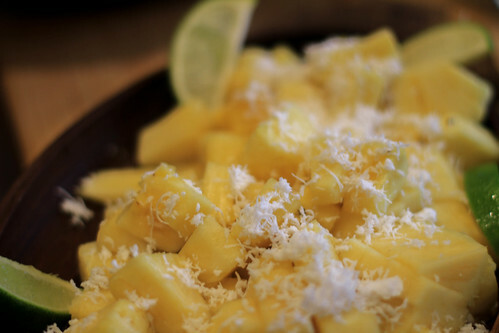 Another pro-tip: buy frozen shredded coconut, it’s about 50 times easier than doing it yourself and sometimes even tastes better than whatever shows up in the produce section at your local market. In a few YouTube videos, I saw people cooking over fire with a few stones to elevate the pot. So I removed the grates from the barbecue, set up a few bricks, built a little fire at their intersection, and put the pot on top. In there are a few different greens, most notably the red-streaked amaranth (native to Mexico, incidentally! 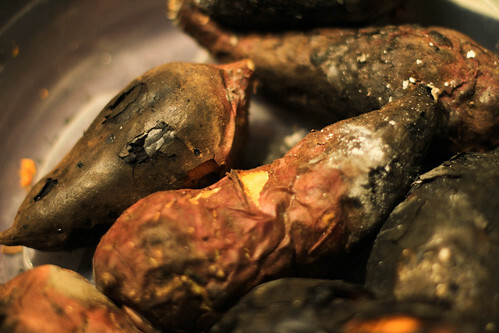 ), plus purple yams, slowly steaming and stewing in coconut milk. The smokiness definitely translated into the dish, which as expected was fine to eat but after a long cook and without spices was fairly basic-tasting. Just stick the potatoes right on the coals. Cut open, and eat whatever isn’t burned. Absolutely delicious. I’m taking sweet potatoes next time I go camping. Instead of a hole in the ground, I used a chiminea, which is typically used as an outdoor heating device, but can certainly be used for cooking. I built a fire in there and placed plenty of bricks on top; in the meantime I made a bulging banana-leaf-wrapped bundle of pork shoulder, greens, and chunks of taro root and pumpkin. I shoved the bundle in as best I could and let it sit for a few hours. 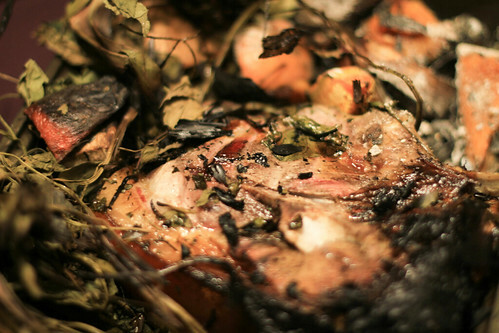 At first it steamed and smoked a whole bunch, as the banana leaves singed and everything inside got really hot; as the heat died down, it smelled more and more like roasting pork and root vegetables. With help from guests, we finally extracted the now-falling-apart bundle, losing some but not too much of the vegetables to the ground. It was really tasty, with the smoke and the banana leaves imparting a ton of flavor. This dish was a disaster. I even managed to find true palm sago and order it from Amazon (most of what’s labeled as “sago” is actually tapioca), but in the end the dumplings broke apart and then I forgot to stir it and it burned so badly that the pot was ruined. So we didn’t have dessert.